Shoji here bringing you an update. Work has started on the next book in the grydscaen series entitled grydscaen: atonement. Natsuya is currently working on the cover and the interior layout. The cover is approved and the interior layout is currently in process. Natsuya is looking to have the book out by end Decmber 2018 or early January 2019. 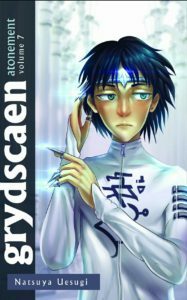 This is volume 7 in the grydscaen series. We are rounding up to the later volumes and the climax to the epic cyberpunk universe that is grydscaen. When Natsuya set out to write grydscaen it was just going to be one book. 9 books later and so many short stories, and grydscaen is still going strong. There was just so much more story to tell Natsuya says. I can happily say that grydscaen is a labor of love both for Natsuya and for me because the story is so rich and diverse and has a well rounded cast of characters. I am glad I can be a part of Natsuya’s vision and will do anything I can here at Natsukoart Design Studio to further Natsuya’s message of diversity and inclusion. I know you want to see the cover featuring Gloughster Illian the trance channeler that can see into the future and counsels the emperor LIno Dejarre. So with no further stalling, check it out. Gloughster is wearing the traditional clothing of a trance channeler to the emperor with his sigil on the front in the Celestial language which reads “Jephastian.” He will be stirring things up in volume 7 of the story and causing a whole bunch of chaos that will have repercussions throughout the Pacific Territories. We look forward to editing the interior and publication of this volume early 2019 in January.